Qamishli (Syria) (AFP) – Hundreds of female protesters took to the streets of the Syrian Kurdish-majority city of Qamishli on Sunday to call for an end to violence against women. Some banging large drums and others ululating, they marched through the streets, an AFP correspondent said. “Underage marriage is a crime,” said one sign held up by a protester, on International Day for the Elimination of Violence against Women. Another demonstrator held up the picture of a woman with a swollen eye, her mouth covered with one hand. “We must take part in this day in large numbers,” said Hanifa Mohammed, 47, wearing a green jumper and a dark-coloured headscarf. Women of all ages carried the portraits of fighters in the Women’s Protection Units (YPJ), the all-female branch of the Syrian Kurdish militia. AFP / Delil souleiman. 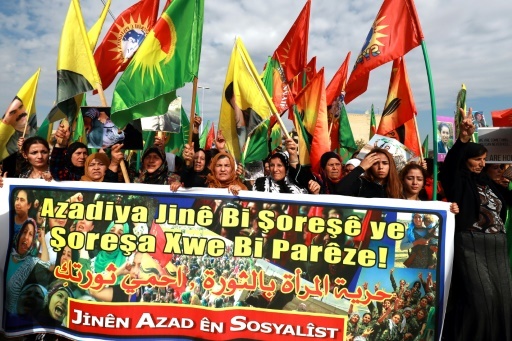 Syrian Kurdish women raise a banner reading in Kurdish and Arabic “woman’s freedom is by revolution, protect your revolution” during a demonstration in the northeastern Syrian city of Qamishli on November 25, 2018. Syria’s Kurds have largely stayed out of the country’s seven-year war, instead setting up semi-autonomous institutions in areas they control in its north and northeast. 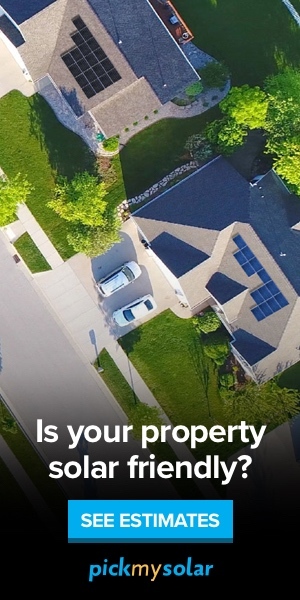 Local institutions are usually co-directed by a man and a woman. Syria’s Kurds pride themselves in promoting equality of the sexes even in combat, as the YPJ play a key role in the battle against the Islamic State jihadist group. Some protesters lashed out at neighbouring Turkey, which considers the Syrian Kurdish militia to be “terrorists”. Ankara and its Syrian proxies have led two campaigns inside Syria against the Kurds, most recently seizing the northwestern enclave of Afrin in March. Organisers dedicated the protest to the women of the enclave, now under control of pro-Turkey rebels. Featured Photo: AFP / Delil Souleiman. 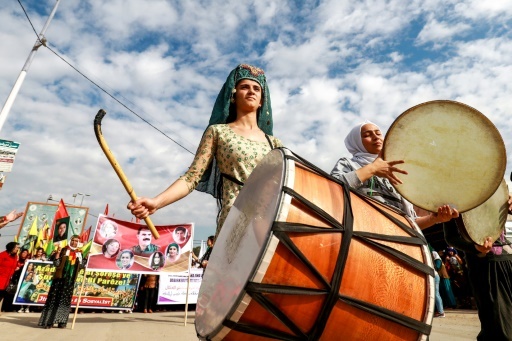 A Syrian Kurdish woman bangs drums as she marches with others during a demonstration in the northeastern Syrian city of Qamishli on November 25, 2018 to mark International Day for the Elimination of Violence against Women.